The utility lets users perfectly crop, resize, rotate, and otherwise tweak their photos—adjusting brightness, contrast, saturation, and more—for import (via iTunes) as contact photos in their iPhones’ address book. The photos will be sized appropriately to appear as full-screen images whenever users receive a call from that contact. 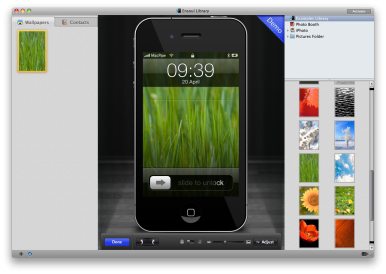 In addition, the app can also be used to format photos for use as iPhone wallpapers. Ensoul can retrieve photos from almost anywhere on a Mac, including iPhoto, Photo Booth and Aperture. If iPhone owners don’t have any photos worth importing to their phones, they can search through MacPaw’s complimentary photo library, Ensoul.me, for accessible pictures. Ensoul is $10 and can only be used on Macs with an Intel processors and OS X 10.6.6 or later. Besides the Mac App Store, the app can be purchased on Macpaw’s Website.